These days, local multiplayer 6 Video Games With Fantastic Local Multiplayer For Dorm Room Gaming 6 Video Games With Fantastic Local Multiplayer For Dorm Room Gaming There are still some titles that faithfully provide an excellent couch experience for multiple players. They either allows for up to four people to play at once, or provide an entertaining enough experience to keep... Read More is practically a national pastime. 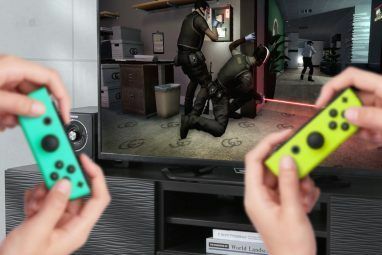 Gaming with friends on a shared screen is a great way to kill time while you hang out, and also opens up some interesting new kinds of games that aren’t a good fit for network multiplayer. For a long time, couch co-op has been deemed the exclusive domain of consoles. PC gaming is inherently solitary, and consoles are inherently social – or so the story goes. However, as the line between PC and consoles gets blurrier with the launch of hybrid devices like the Steam Machines Steam Machines Are Finally Coming! Here's What You Need to Know Steam Machines Are Finally Coming! Here's What You Need to Know Read More , the situation has started to change. 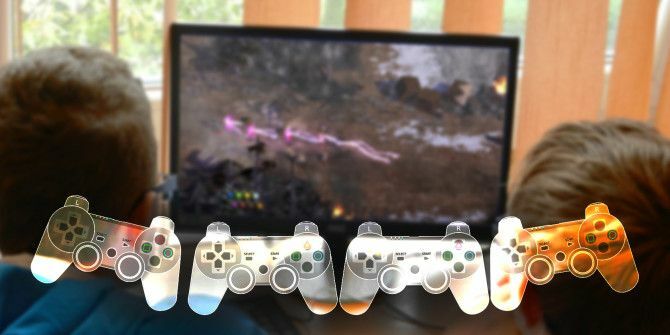 A number of PC titles with great local multiplayer features have started to crop up, taking advantage of the growing market of PC gamers who own multiple gamepads, and aren’t afraid to use them. Today, we’re going to run down some of the best local co-op games available on the PC, as well as advice on how to get the most out of them. TowerFall, originally an Ouya OUYA Review And Giveaway OUYA Review And Giveaway When the OUYA was first announced and funded on Kickstarter, the Internet was positively buzzing over the possibilities for this tiny Android-based console. Kickstarter backers began receiving their consoles months ago, and early reports were... Read More game – of all things – is a 2D arena platformer / shooter in which up to four hyperactive archers duke it out in non-euclidean ruins. You can kill your opponents using either your bow or Mario-style head stomps. Ammo and movement powers can be unlocked from chests which drop early in each round, as can shields that give you an extra life. It’s hard to explain exactly why TowerFall is so good. It gets some extremely subtle things right, and the result is a bizarrely satisfying experience. It feels a little like Smash Bros. in instant-death mode. It’s slick, fast-paced, and incredibly fun. If the game gets stale, there’s a seemingly endless supply of game mutators you can play with (I’m a fan of the exploding corpse option). You can pick up TowerFall on Steam for $14.99. Mount Your Friends is a game that’s fun half because it’s genuinely well designed, and half because of its fundamental absurdity. The game is an unholy fusion of QWOP, twister, and King of the Hill. In the game, an unlimited number of players pass a single controller around a room, controlling a succession of mostly naked, well-endowed, and alarmed-looking cartoon wrestlers, all struggling to get to the top of the man-pile. The game starts off with lots of giggling about the obvious, but I find that it tends to get very serious very fast. As the pile gets taller, getting to the top gets more and more brutally challenging. The intentionally frustrating controls contribute to an extremely high level of tension, trash-talking, and general tomfoolery. Friendships are made and lost over this game. On the whole, Mount Your Friends remains one of the greatest party games ever made. You can pick up Mount Your Friends on Steam for $4.99. Remember playing GoldenEye on the Nintendo 64? And remember when your cheating little disappointment of a younger sibling would peek at your screen so he could sneak up on you? This game is pretty much just that, over and over again. It’s more fun than it sounds. Screencheat is a class-based multiplayer shooter that takes place in cramped, color-coded arenas. The twist is that the players are all invisible. The only way to tell where they are is by looking at their screens. In practice, trying to keep track of three other players’ perspectives is genuinely challenging, and getting good at it is a lot of fun. While the game is a little slow to get into, the gameplay is genuinely interesting, and the game has some of the strangest weapons I’ve ever seen in a shooter. This is a great game to break out at the end of the evening and watch people’s brains herniate trying to keep up. You can pick up Screen Cheat on Steam for $14.99. Magicka, another indie game, is an up-to-four-player top-down local multiplayer shooter. Unlike many of these games, it’s cooperative and story driven, as you and your friends fight your way across a number of levels in an effort to take down an evil wizard. The magic mechanic at the heart of the game is very unlike traditional role-playing game magic. There’s no ‘magicka’ resource to speak of, and there’s little in the way of loot or items. Instead, you have a set of eight basic elements (plus two additional combo elements) that can be chained together in various orders to produce different spells. These can get quite complicated, and have different effects depending on the enemy and environment, leading to tense and challenging gameplay (as well as lots of yelling at your friends). Magicka is dark, funny, and a little bit brilliant. You can pick up Magicka on Steam for $9.99. Another entry for the ‘absurd’ category, Gang Beasts is a fighting game built around procedural animation. The technology, which animates the colorful, doughy ragdolls, isn’t actually very good – it has a sloppy, heavy, uncontrolled quality to it. However, like Surgeon Simulator, the limitations are part of the fun. There’s something deeply enjoyable about watching tranquilizer-addled pillsbury doughboy lookalikes beat the tar out of each other. The game is still in early access, and has a number of polish issues and a real lack of content (along with more maps, I’d be interested to see the developers experiment with weapons and vehicles in the future). However, even in its early state, the game is very fun to play and completely hilarious to watch. You can pick up Gang Beasts on Steam for $19.99. Goat Simulator is a slapstick sandbox game in which you play a goat in a series of open world arenas. The game’s fun is derived from its absurdity, broken physics, and variety of weird, arbitrary set pieces. I won’t insult you by claiming that Goat Simulator is a good game – but it does have local co-op, which elevates what is otherwise a five-minute novelty into something genuinely enjoyable. Riding a roller coaster in single-player Goat Simulator is a little sad, but riding the same roller coaster with three friends is completely hilarious. This is the Birddemic of games – and, like Birdemic, it’s best enjoyed with friends while a little drunk. You can pick up Goat Simulator on Steam for $9.99. 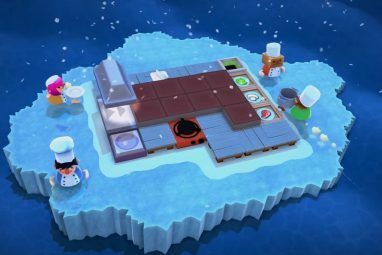 Honestly, any of the Lego games could go here, as they play very similarly. Star Wars is my personal favorite, but only because of my love affair of that franchise (and really any game involving lightsabers). These games are genuinely fun, family friendly, and easy for almost anyone to pick up and play. If you’re looking for a local multiplayer game to play with kids, this is probably your best bet. You can pick up Lego Star Wars on Steam for $19.99. 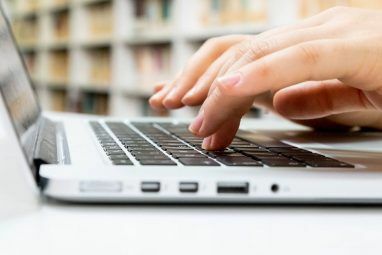 If you haven’t used a PC for this before, the prospect can be a little daunting. Fortunately, it isn’t too complicated. While full-tower gaming PCs are not quite as sleek as their console brethren, there are a number of slim form factor PCs coming out designed for the living room – including the Steam Machine lineup Alienware Alpha Review And Giveaway Alienware Alpha Review And Giveaway Tired of waiting for Steam OS? The Alienware Alpha is a $500 console-sized PC gaming machine. Read the review, then enter to win your own. Read More . If you don’t want to go to the trouble of buying a new machine, you can also remotely connect your exiting gaming PC to your TV using the Steam Link or similar streaming hardware 5 Ways to Stream Video Games From PC to TV 5 Ways to Stream Video Games From PC to TV There are a handful of ways to stream video games from your PC to your TV. In this article, we take a quick look at them all. Read More . On the controller side, there are a number of options available. Personally, I suggest buying a half a dozen cheap PC gamepads – and I do mean cheap. Something like this. Cheap. These are for your friends, they’ll like you no matter what. Then you’ll want to pick up something for yourself that you actually like. People seem to like the Xbox One gamepad. Personally, if you’re willing to wait a bit, I recommend picking up the Steam Controller. It’s about the same price, and it’s weird enough that I suspect it’ll be really good. You want one of these, because if you have a machine for living room gaming, you’ll find yourself playing plenty of single-player games on it. You’ll want something that doesn’t feel like it’s made of paperclips and gum. You’re also going to want a cheap wireless keyboard-touchpad combo. Something like this. While Steam Big Picture mode theoretically allows you to interact with Steam and launch everything through through a gamepad, plenty of games manage to screw this up. You’ll want access to a mouse often enough that it’s worth having one around. Plus, it’s handy for Spotify and Netflix. PC couch co-op is experiencing a renaissance at the moment, largely due to the efforts of indie game developers. There’s never been a better time to dive in. Do we miss a great PC couch co-op title? Let us know in the comments! Explore more about: Multiplayer Games, Steam. Assassin’s Creed Unity Is Free on PC (Temporarily)Is New Indie Action RPG Kyn Worth Buying? buy medical marijuana today and have it delivered to your home address . I'm not sure you've quite got the meaning of the word "co-op". TowerFall and ScreenCheat especially are more about beating your friends than working with them... they're both great fun though. You forgot Castle Crushers, Rayman Origins, Gauntlet and Trine 1 & 2.